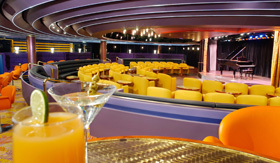 Holland America’s Nieuw Amsterdam is the fourth in a long line of illustrious ships of the same name. The first ms Nieuw Amsterdam served during WWI, the second is the model for Holland America’s logo and was a favorite amongst Hollywood heavy hitters like Rita Hayworth and Spencer Tracy. Taking a bit from each of her predecessors, this ship features the latest additions to Holland America’s fleet with Tamarind, a pan-Asian restaurant, the Explorer’s Lounge Bar, which offers wine tastings, and a new luxury jewelry boutique. This Nieuw Amsterdam also gives a nod to New York, the city she’s named after, with exquisite art displayed throughout the ship. 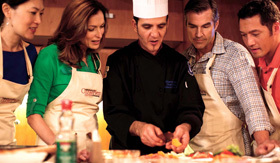 Holland America prides themselves on their cuisine, offering an array of delicious meals and accommodating those with special diets. Besides sharing these dishes onboard, Holland America has built a state-of-the-art Culinary Arts Center with help from Food & Wine Magazine. The Nieuw Amsterdam’s Culinary Arts Center offers passengers a chance to learn to cook their favorite dishes alongside acclaimed chefs. Make sure to spend one evening of your cruise in Tamarind, the specialty restaurant onboard the Nieuw Amsterdam that has gotten rave reviews from Conde Nast. 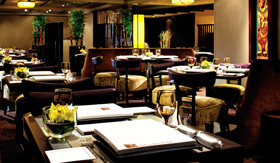 Serving dishes that reference the flavors of Asia, you’ll find amazing ingredients and flavors in each of your dishes. Some of our favorites include the Ying Yang Scallop Consomme, Hoison-Lime Glazed Swai and Vietnamese-Style Lamb with Mint. You may be sailing, but you’ll feel like you just walked into a Memphis bar when you head to the B.B. King’s Blues Club held five nights a week in the Queen’s Lounge. An eight-piece band gets the crowded grooving to the Memphis Blues. Themed specialty drinks and video projections tracing the history of the blues help fully immerse you in the mood.